Getting a call for an interview is generally considered a tough task to get it. If you are one of those who are going to the interview for a job that you are keen on getting then it is good to be prepared for it. Every job interview has different kind of questions to ask during an interview depending upon the employer and their requirement, which also varies from person to person. 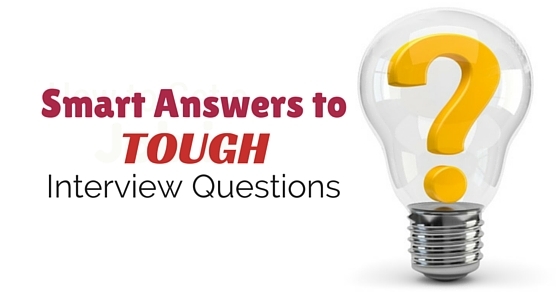 But there are some very tough interview questions asked which if answered well can bring a step closer to your job. Hence, ensure to prepare for the job interview answers before itself and practice few days before the interview, a well-prepared smart answer to interview questions will save the day for you. The following mentioned are few job interview tips and interview techniques on answering the tough interview questions to ask at a job interview. While answering these top interview questions be sure to tell the right facts about your strength and what exactly makes you a good candidate, share the right examples and can also mention how you learnt about your skills. What is that specific skill of yours that will make you a company’s asset and how you will be able to provide advantages to the company. For example, if communication is your skill then share how you got an issue resolved by making a right communication. A common tricky question asked, whether you are the one that picks or you manage it well is totally on you. Explain how in short deadlines you managed to bring out the best results. Like you don’t panic but try motivating everyone around you to deliver the best results for the company. You can mention that working under pressure generally bring the best in you too. Within a team, there are various kinds of people that one has to work with? it is not necessary that everyone will agree with you, then how you intend to manage the whole team to deliver the results and resolve the differences. You can mention that you will talk to the person on the personal basis and try to understand his point of view, and also explain your viewpoint. Then you both can look for the common ground to work together and resolve the issues. Everyone has a different belief system, therefore, avoid answering this on the religious or political basis. Even if you have the strong opinion, it is better not to share with others, since one does not know how this might turn out to be. The smart answer could be more of a diplomatic approach, or better to talk your belief system which is work related. Explain how you took measures to do the right thing for a company and did not look out for a step which was just about short term gain. The idea of success varies from person to person, for some it is just to be with family, for others it could be earning a lot of fame and money. You can explain how your own parameters of success are, what will make you truly happy on the professional front and continue further as that it is difficult to be truly successful since one has to constantly strive for the best. Money is the most tempting factor for anyone and most people generally do the job to get money? Therefore, what if you are a millionaire now, will you be putting up for this job is the idea behind this question. Remember you have not got the money nor anyone is going to give you right now, therefore, be smart in answering this situational interview question. One can say that they might donate it for a better cause or invest in something for future rather than not working. After a certain period of time everyone intends to get promotion in future, hence if this common interview question comes up then you can mention that your motivation to learn new is quite high and you intend to deliver the best for the company, hence you will definitely get a chance for promotion. Showing a certain amount of faith in the company’s system is important. Switching jobs is a general question that is asked frequently. Avoid saying something negative about your company rather you can mention the growth opportunities this company is providing is quite motivating to come for. How, you think that you will be a better fit for this place and will be able to deliver the best results. Some people do get fired for one or the other reason, but this should not discourage you from looking out for jobs. Learn from your mistakes and move ahead, rather than blaming others for you begin fired it is good to own up your issues and explain how you learnt and grew as a person. Some people staying in a single job profile for years tend to change their entire career path later stages, hence, this kind of question is common to be asked. Mention what made you think to pursue this job and how your previous experience will be an add on for this company. Do mention that entry level job will give you complete knowledge and will learn more, and with time, you will grow in the company itself. Are you a risk taker and go beyond your comfort zone to achieve best results. One cannot be successful if always play safely in their life, getting out of comfort zone to get something is always a challenge. Share your examples of risks that you took and how it actually benefited the company, how you faced criticism initially but later you got the applause the risk you took on. Everyone has a dream job there they want to work. From being an entrepreneur to a CEO. Give a smart answer in such a way that it should make the interviewer feel the company is part of it, but do not say getting this job is the dream job. You can mention that you intend to be a marketing head or a brand manager, something which the company is able to see you as a potential long-term candidate. Someone who will stick to the company and bring benefits to the company altogether. When you land up in a situation where you need to choose between two people then how you will handle that situation. Ensure to mention that you will do your best to be rational while making a decision and try your level best to be fair. Infact, if the other person feels you being biased then you will talk to the person separately trying to explain the reasons in which you had to take such decisions and don’t intend intentional harm. Despite, in the world where everyone talks about equality, there are still a lot of men who had trouble handling a female boss? You can explain that you can easily work under a female as a boss, sharing the example of your mother who taught you to be a better person and inspired you to achieve the best in your life. Hence, you will be extremely happy to work under a woman where you will get the opportunity to learn the most not only about the job but also a smart management technique in which women are quite good as compared to men. It is a common scenario in many work situations? You can mention that you might allow your teammate to take the glory but will expect the favor to be returned. If this does not happens then you will talk it to the person and try to get the arrangement that during presentation both of the parties are equal getting the credit for the hard work. If this situation is with your boss, then it is to note that you will allow your boss to take the glory and will be happy with the raise as an acknowledgement. Going to an office every Monday is generally a dreadful scenario for many but what if the person has to work on weekends too, then it is a nightmare? Be comfortable with the idea of working on weekends occasionally where you have to go out of your comfort zone to deliver the best results. Share that you are fine with it and take it as an opportunity to show the best in you to the company. Every decision taken by the person is not necessarily the best one, hence rather than mentioning something which can show your negative side best is to answer smartly and say how you, in fact, prevented and escalated the issues that could have resulted in the loss to the company. Mention your proactive attitude towards the work and how to always look out for the opportunities for the benefit for your employer. Both of them are important at their own space. Favoring only on luck shows that you don’t believe in hard work or skill, and when talking about only skill seems as you don’t prefer the opportunities that come your way. Explain how both of them are important and work together, for example, getting this job interview out of thousands of was a chance of luck for you but getting the job will totally be dependent on your skill of your presentation and interview. At the end of the day, results achieved matter the most. Are you the go-getter and will find the methods to get the job done or are you someone who depend on other for the work to be done. Explain with examples, that where you went ahead of the duty call and delivered the results as it was essential for the time. Like if you require the permission for your boss on an issue and he was not able to answer your call you took the charge and resolved the issue without any delay, but informed your boss about the same also. Working in a group of people everyone’s opinion matters and what they think of you as a person. Do they look up to you and see you as a leader or as someone who is not reliable? A way for the interviewer to understand your personality. Mention the instances where your teammates came up to you with a problem and how you were able to solve it efficiently or where you intently listened to the person’s problem and help them out to get it resolved. With sensible answers, patience and confidence getting your dream job will never be a faraway dream. Ensure that you do have a confident smile while answering and are not nervous while giving your answers. Be honest and avoid saying a lie because if the truth is perceived then later it might hamper your reputation. If in case you find the true answer might not work in your favor, then the best is to give good diplomatic answers and stress on you positive interview skills and talent. With patience and perseverance, anything is possible.